34. 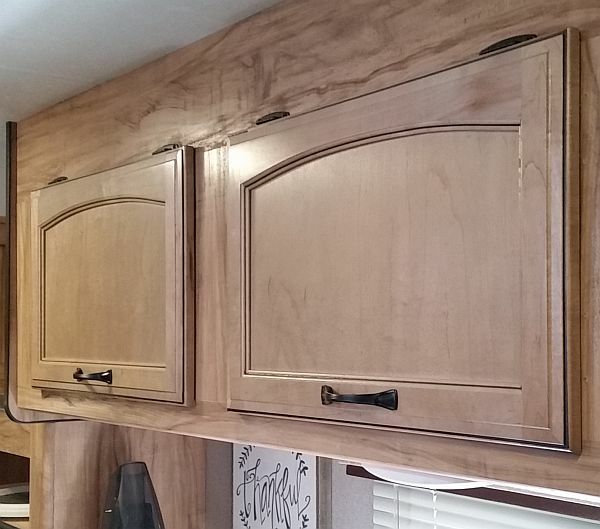 Back inside- We did not like that the cupboard doors over the sink opened out (hinges on sides). ...and added spring loaded door struts to keep them open. The difference is night and day. Before we had to back up to keep the doors from hitting our face as we opened them. Then while they were open they were sitting out in the walkway at face level. Now they can sit open above head level, not blocking anything. 35. 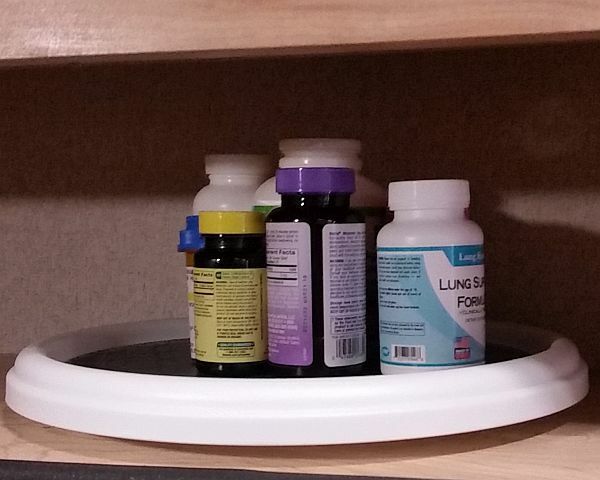 While working on the cupboards we also added shelves and non-slip inserts. 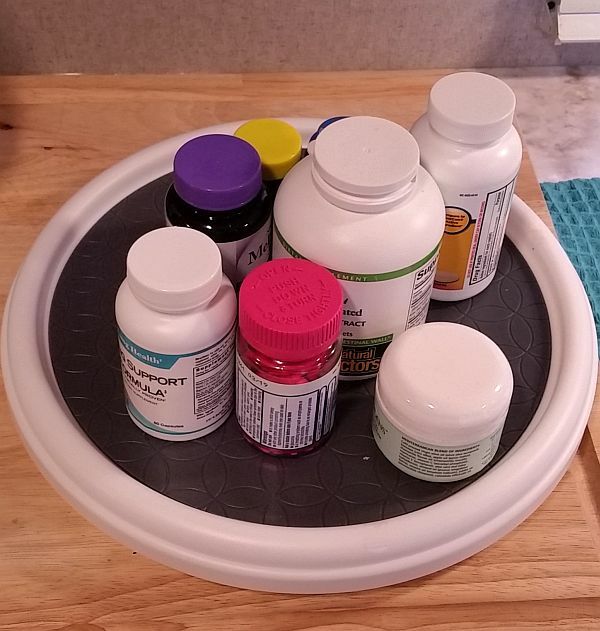 These allow us to use all the space without having to stack and un-stack to get to something. 36. While in the shelf making mode...we put this one at the head of the bed. 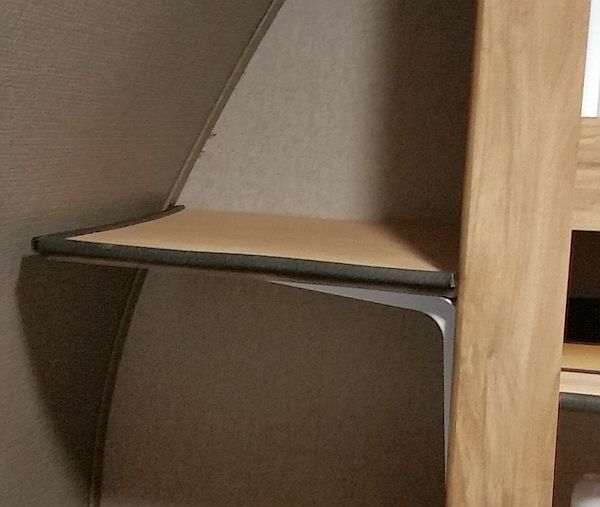 It is a nice little alcove, but it is 3 feet tall, by putting this shelf in the middle we have much more usable space. 37. While we were at it we put Two More shelves here...at the heights that worked for us on what we wanted to use them for...effectively doubling our usable space. 38. 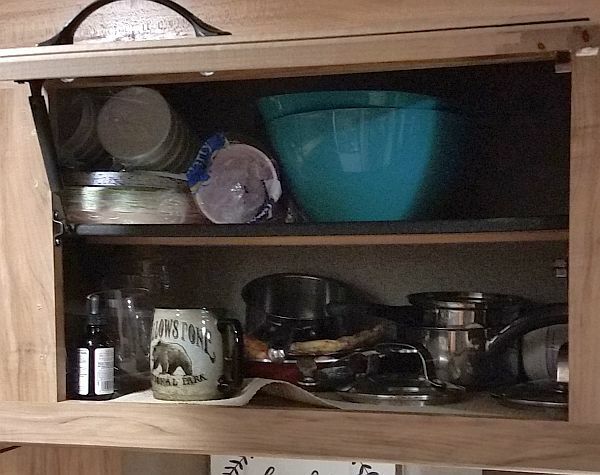 Below the microwave is a cupboard door. 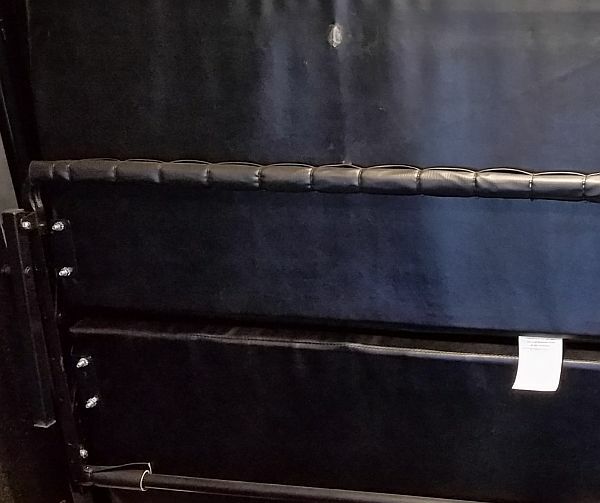 It had a false wall set in at an angle. 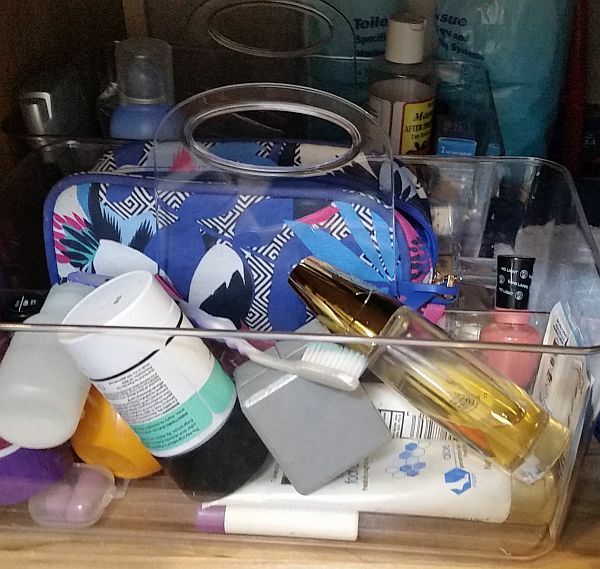 This resulted in the available storage space angling from 4" deep to 10" deep. Not really very useful. I know why they did it...it was an easy way to wall off the propane hose that is routed up to the stove. But they way they did it really wasted a bunch of space. I moved the wall back a good distance. I also put a foam noodle around the hose to give it some protection. We now have a space that is 16" deep. Much better! 39. 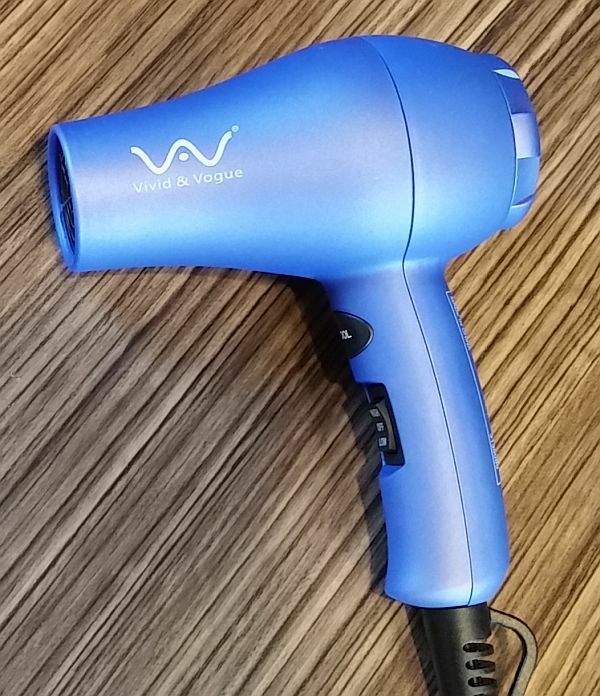 Since we have been doing a lot of cold weather traveling, we picked up this little gem. A DampRid. It is doing a nice job at helping keep it dry inside. 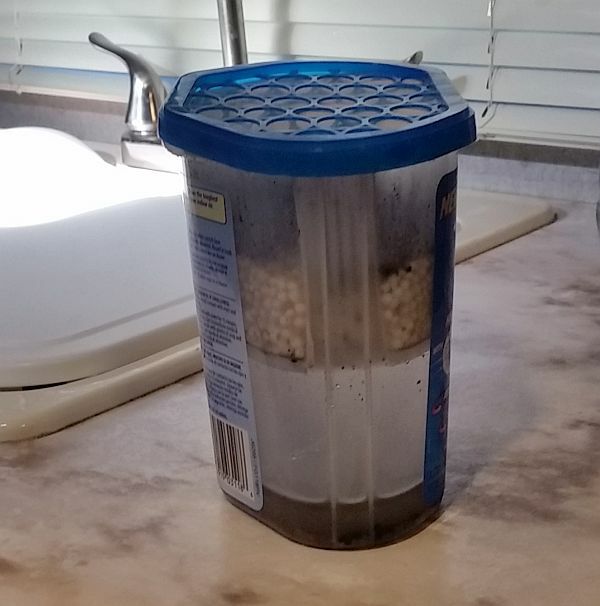 You can see the liquid in the bottom that has collected. 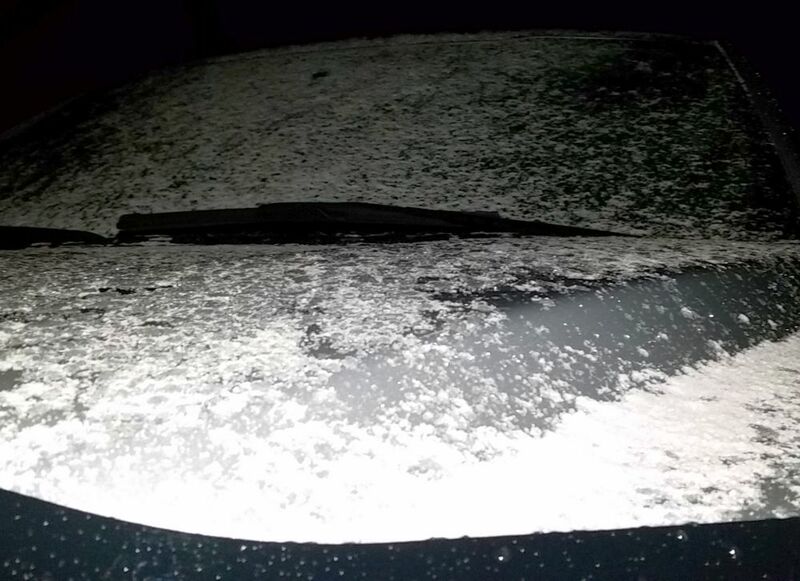 We thought we may need a dehumidifier, but between running our heat, keeping a ceiling vent cracked and this, we are not having any condensation inside. 40. 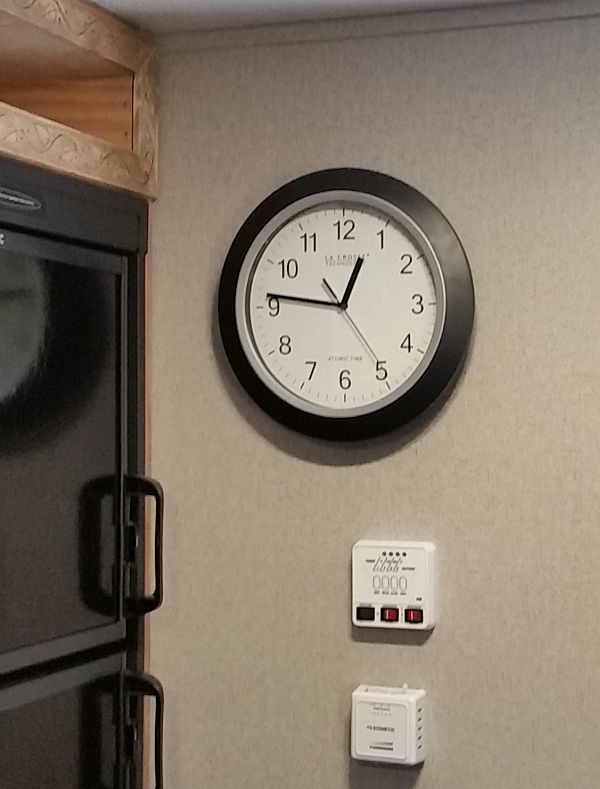 The trailer came with a nice clock...I thought...but Mary could hear it ticking at night. Yep, she's got much better hearing than I. So this clock is silent, and now in place of the OEM clock. More mods coming as I have time to take pics and post them up. 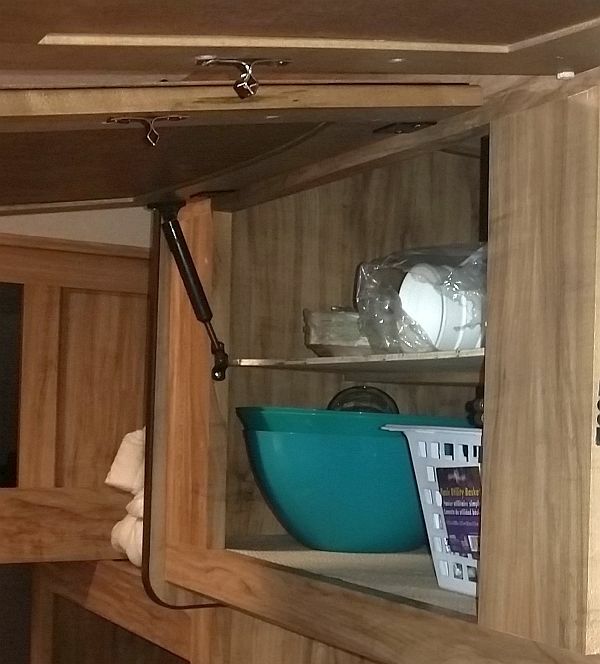 **** you, now I'm going to have to do the cabinet door mod, DW has hit her head on the doors over the front bed more than once and I can't see myself not doing it now that I know it can be done rather trivially. Took some more pics...all inside, we have a bit of snow outside. 41. 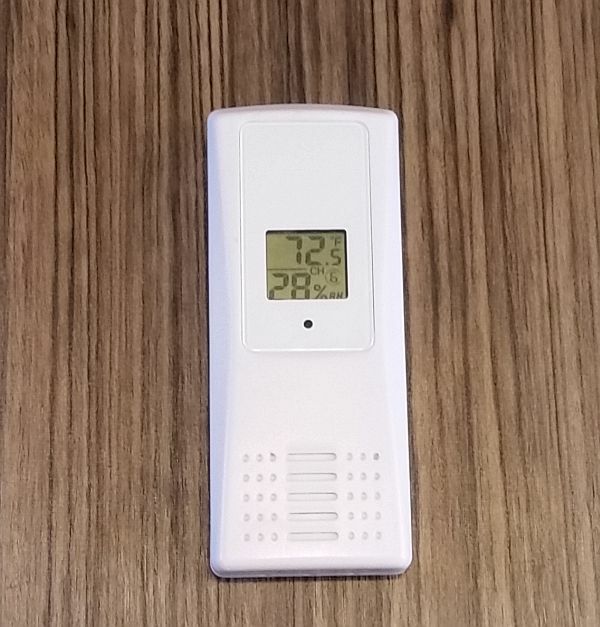 Digital Temp & Humidity Gauge. This is part of a wireless kit that we have at our home. The main station reads 6 different units like this one. 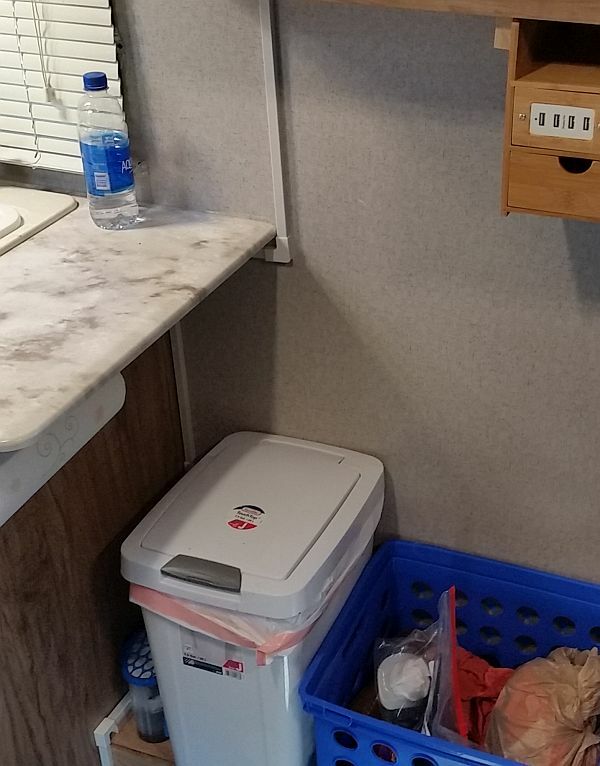 Each unit displays the temp and humidity, and the same info is displayed on the main station that Mary keeps on the kitchen counter. btw, it is a toasty 72* inside, and 29* outside. 42. When we have shore power/generator power, this is our main source of heat. 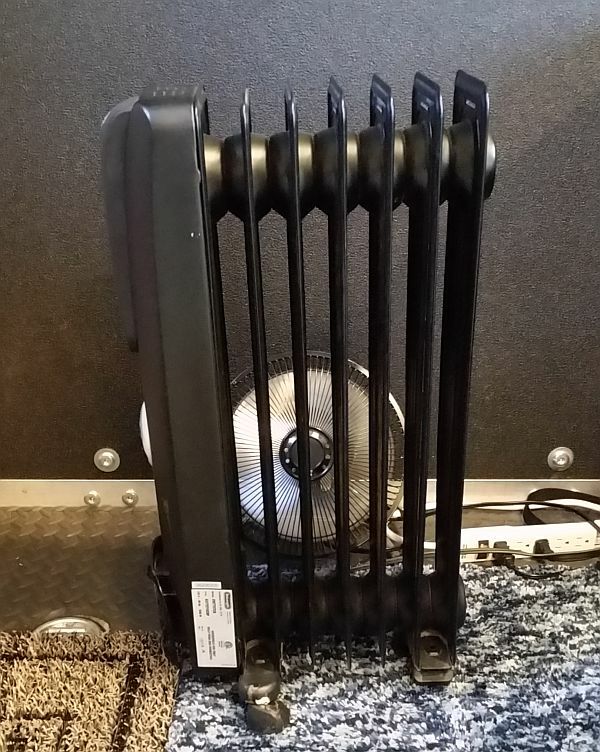 An oil filled radiator with a small fan blowing across it. When the rig is in the driveway we are plugged into shore power. If we are stationary for more than a day with shore power or the genny running, we use this. For overnight stops we don't break this out, we use the propane furnace. Also, this takes a while to heat everything up if starting from cold, so we'll give it a head start by running the propane furnace to get it warm, then most of the time the oil filled radiator can maintain a nice temp...if it is so cold that the temp drops down, then the furnace will kick on. While it has all the above options, and is lightweight, it does not push as much air as we thought it would. But it is definitely nice to get some air movement and we have used it quite a bit. 44. 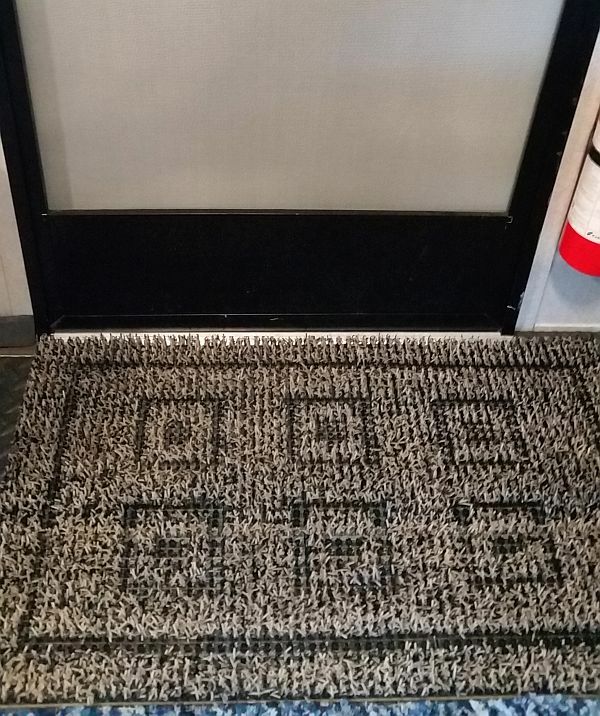 Door mat does a really good job at cutting down on how much dirt is tracked in. 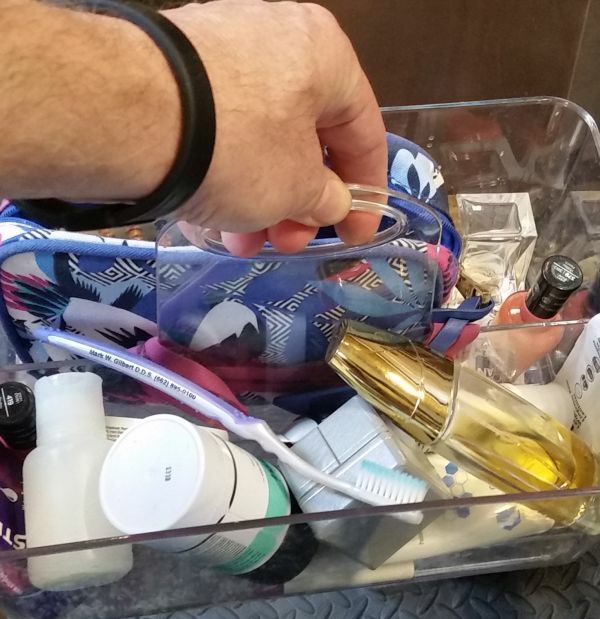 ...are easy to pick up and move around (and find stuff in). Sometimes we just put them in the shower (out of the way). Easy enough to move when shower is used. 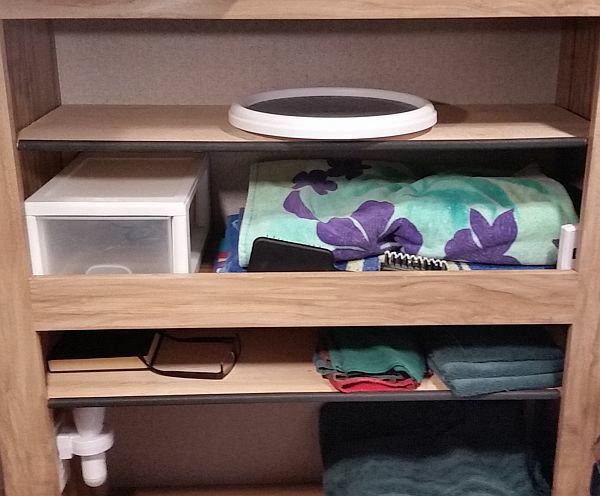 With the small bathroom we have, no cabinet and only the one shelf we put in, these trays have proved very convenient. 46. 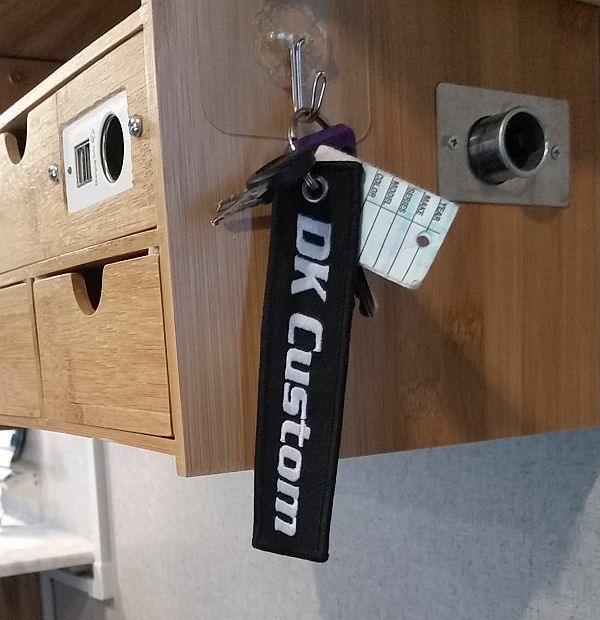 Another small item that is very convenient and has saved time looking around...a key hook right inside the door. 47. 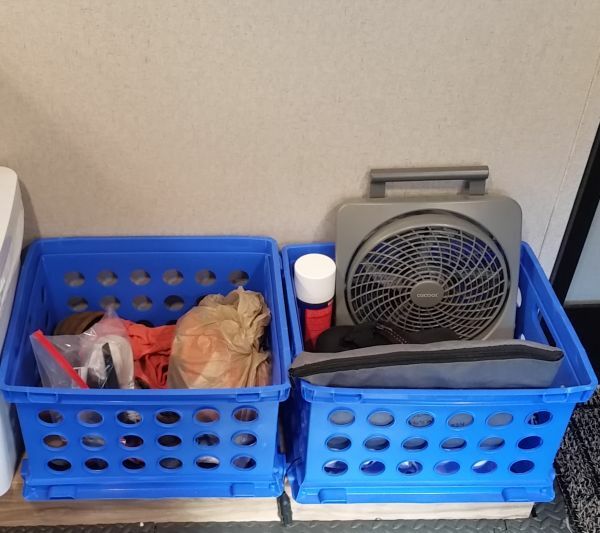 Couple of crates sitting on the wheel well that we use as a catch-all. 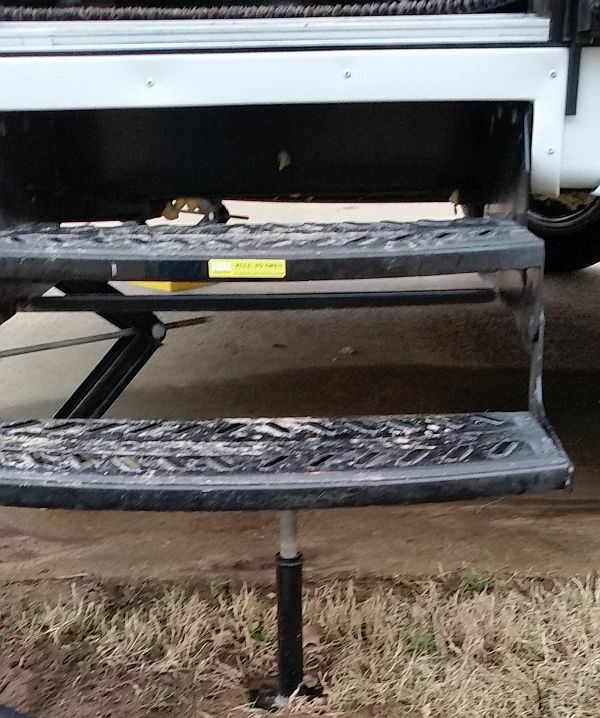 Amazingly, these stay in place and have never slid off the wheel well in over 7k miles of travel. 48. Fridge circulation fan. We've used this a couple of times. 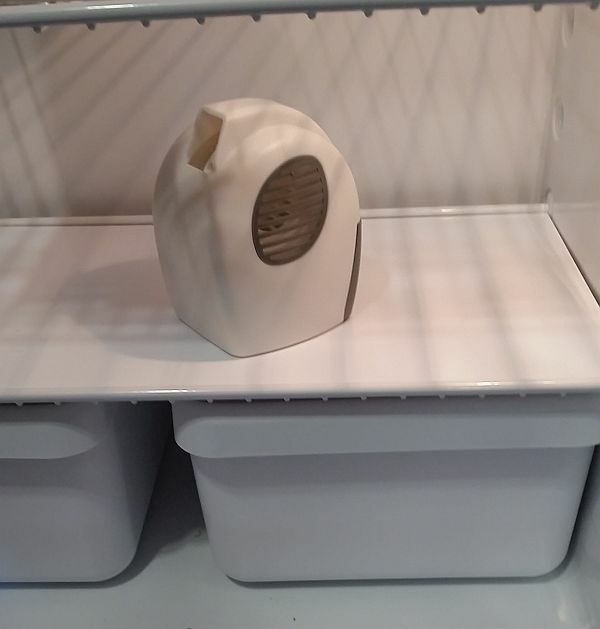 I think it is only really useful when the fridge for is starting to cool down. It helps it cool down faster. 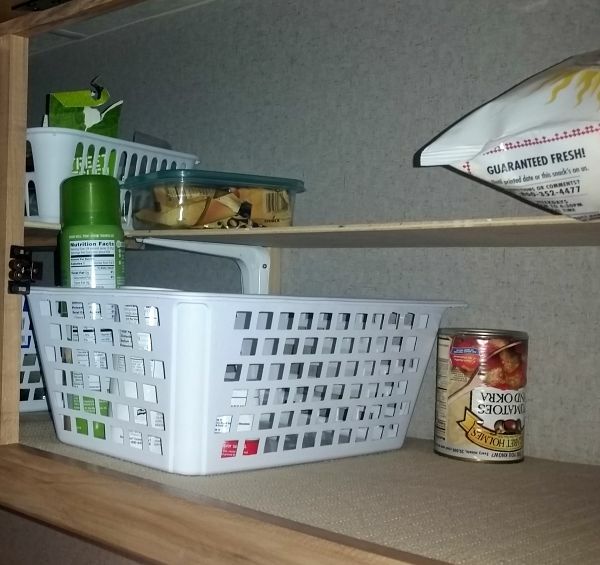 But since we keep the fridge going, pretty much all the time...not so needed. BUT, it does do a good job at accelerating the cool down time. Thanks for posting all of those ideas and the photos! I love this and will be borrowing some of these for sure. 49. We ran wire from our fuse box, under the padded floor, and then up the wall over to our USB/Power Station. 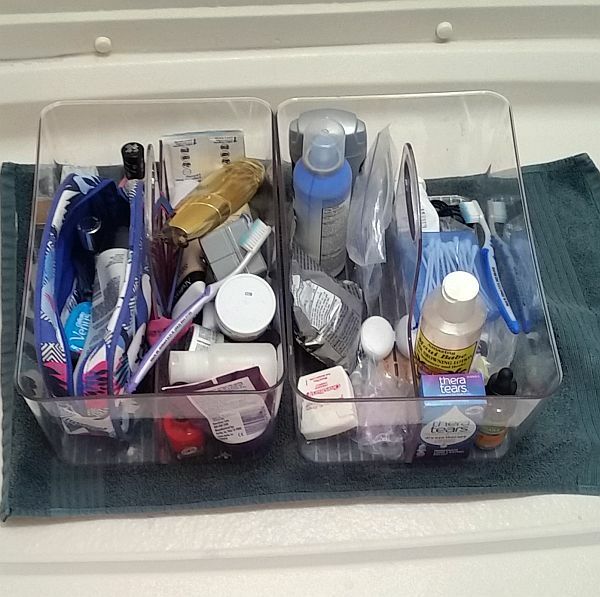 To make it neat, protected, and a bit less obtrusive looking we used a cable concealer kit. ...and how it looks normally. We are happy with it, and it was far easier/better than drilling and pulling wires thru the ceiling. 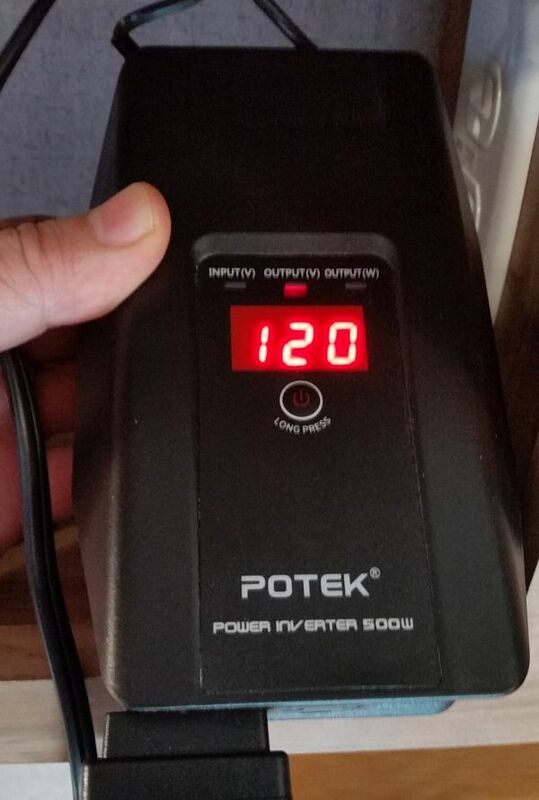 ...On high it pulls 1000 watts, but on low it only pulls 500 watts, which is low enough to run off our small inverter. 53. 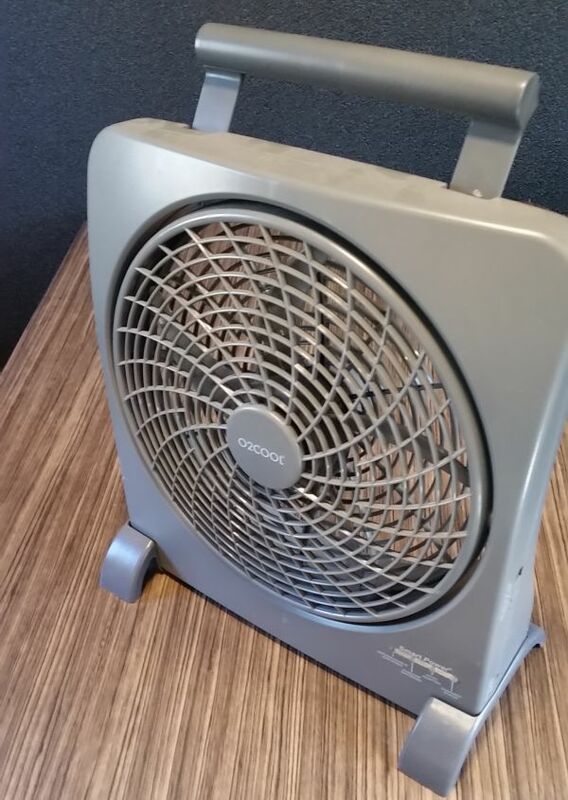 After a fair amount of looking around, Mary got this HoLife wet/dry "dustbuster". It is quite helpful at keeping things clean. Charges off 120v and runs about 30 minutes (far more than needed in a typical week) off that charge. ...then can pull it out and access everything easily. Amazingly, going down the road, everything stays put on its' non-slip surface. 55. 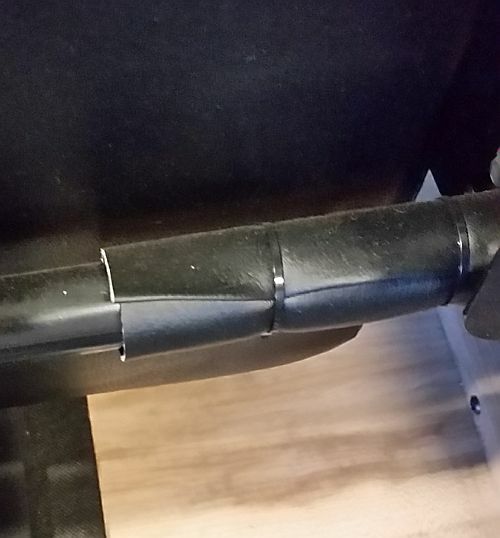 After very little use we noticed that some of the support rails on the underside of the fold up couch were starting to wear holes in the covering. 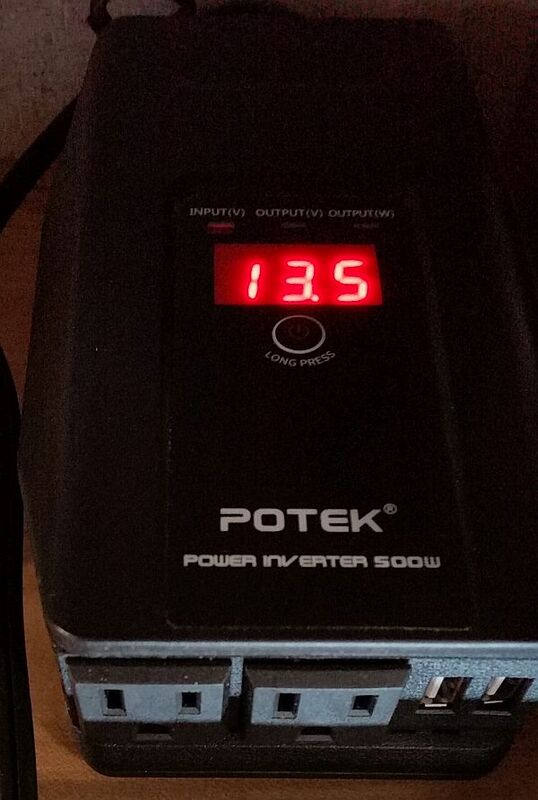 3- DC voltage being supplied TO the inverter. 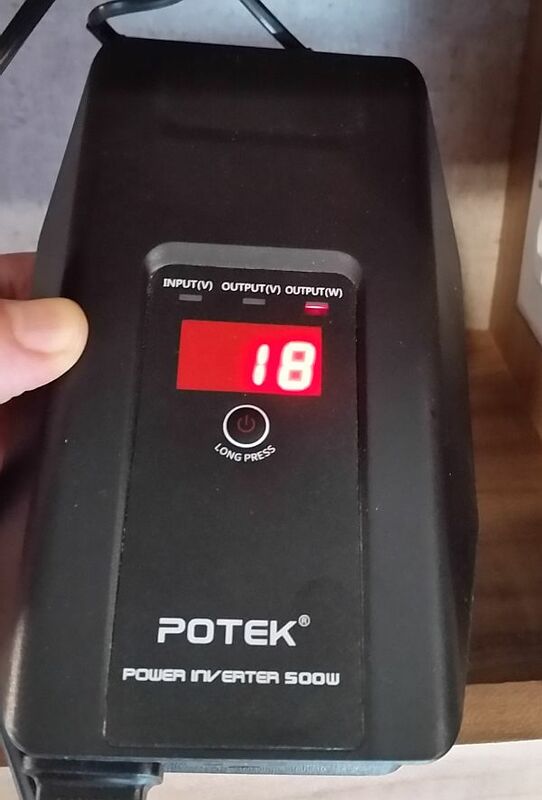 It is at 13.5v because shore power is connected, giving the batteries a maintenance charge. 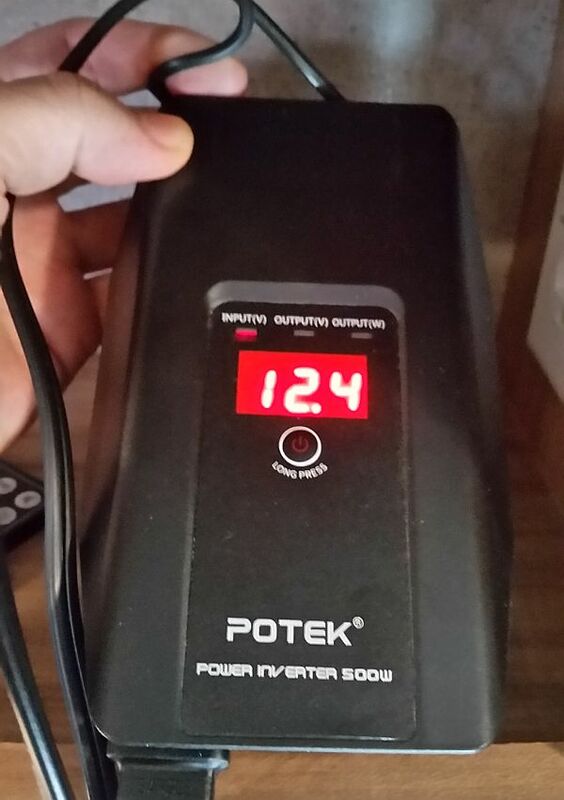 4- DC voltage being supplied to the inverter from the batteries with no shore power, and a normal load on them. 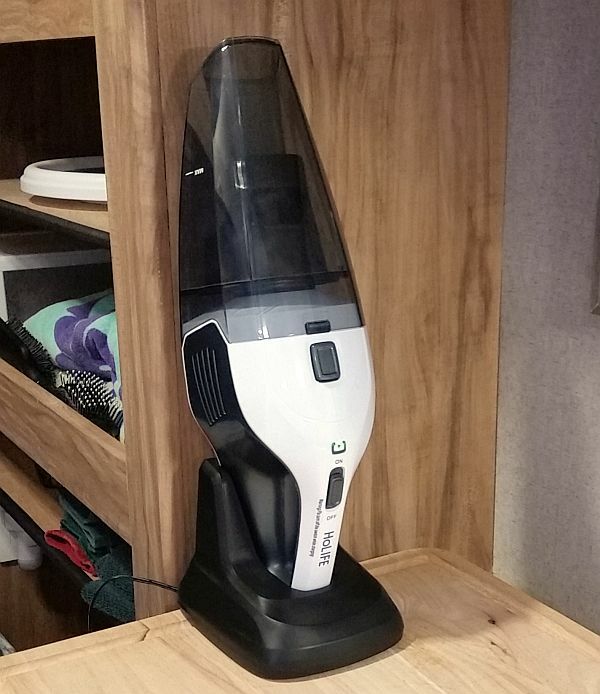 Besides this inverter having two 120v outlets, it also has two USB charging ports. It also came with two ways to power it...a 12v power point plug (which is what we normally use) and also battery clamps, so it can be hooked directly to a 12 volt battery. Got plenty more, have to take some more pics. Will do so and post up as time allows. Wow, been a busy last two weeks. 57. 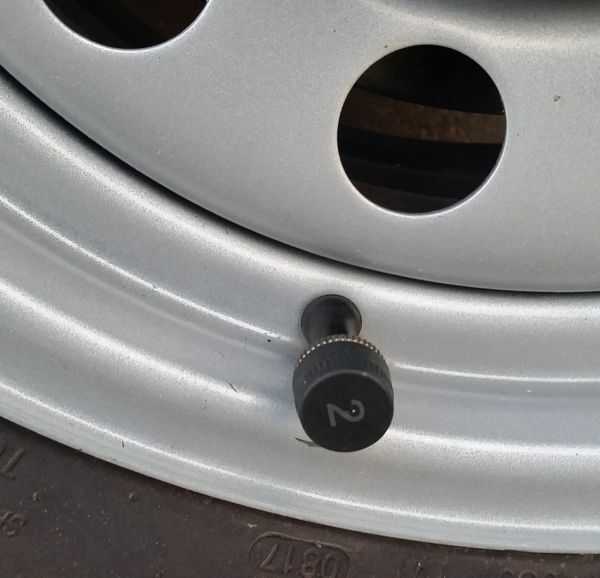 TPMS. After reading so much about blow-outs that folks have, and damage done, I decided it was a must to have a Tire Pressure Monitoring System. Also, wanted it to have a temperature read out. What's weird is that I've been pulling trailers of different types for over 40 years and never thought about having one. I've only ever had one blow-out in those 40+ years. It was in July about 15 years ago, in Arizona, pulling an overloaded tandem axle flatbead with a Dodge Cummins powered 2500. The trailer had an F150 on it, along with about 10k lbs of other stuff. It was a non-event. Tire blew, pulled to the side of the road, swapped it out with the spare and was on my way. BUT, with all the horror stories I read, plus the TT's having a higher profile, I wanted one. Part of the kit is a solar powered (it also has batteries) monitor. I ran it loose on the dash for awhile. After I was comfortable that I liked the system, and I knew where I could put it on the windshield, I installed it in the upper left. 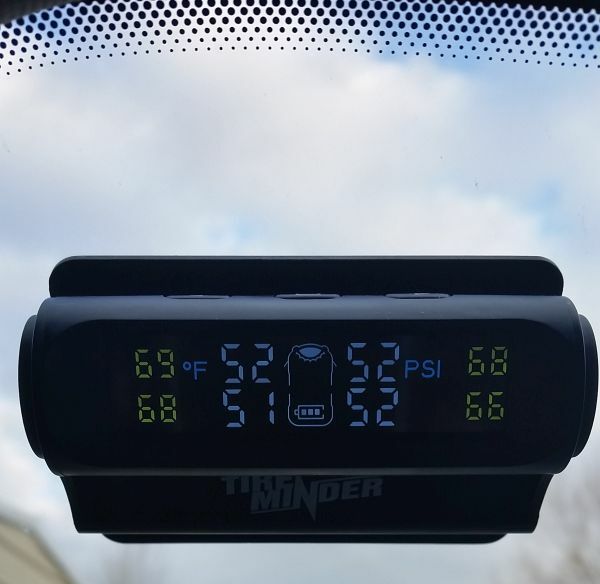 It does not block my view, but it is always there for me to see what the temperature and PSI is of each tire. It will also beep and flash if any one of the tires have a sudden loss of PSI or gets too hot. I can attest to this working. In the initial setup you enter the Max PSI of the tire into the monitor. For my tires that is 50 psi. We left on a trip, where I had put all the tires (cold) to 50 psi when the ambient temp was 70 degrees. One night on the trip we stayed in a rest stop and the temps had dropped to 18 degrees. When we were leaving out in the morning it had warmed up to a whopping 21 degrees. The difference in ambient temps had dropped the psi in the tires to 40 and the monitor was beeping and flashing. I drove slowly for a few miles, letting the tires warm up. As soon as they all hit 42 psi the beeping and flashing stopped. Within 30-40 minutes all the tires had warmed up enough that they were at 48-49 psi. 58. 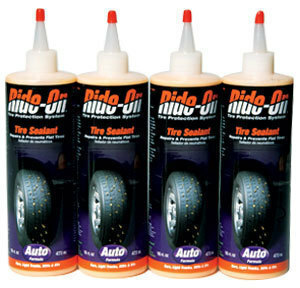 Another thing I did for the tires is put Ride-On tire sealant in each tire. 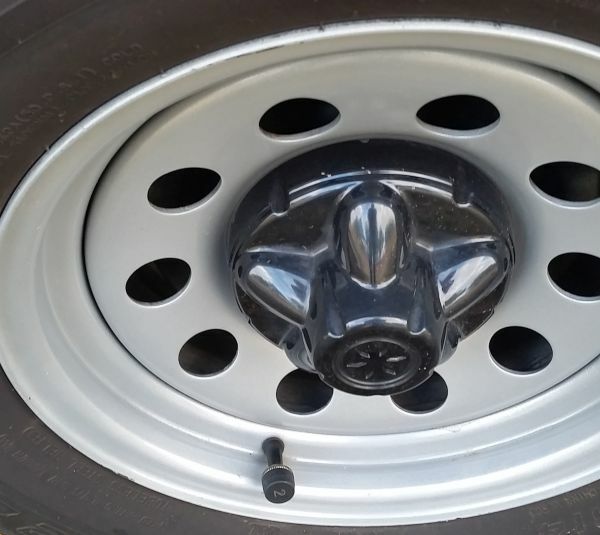 Not only does it prevent leaking from small punctures, it also balances the tire. It was an easy, no mess deal. Unlike slime or other sealants. 59. 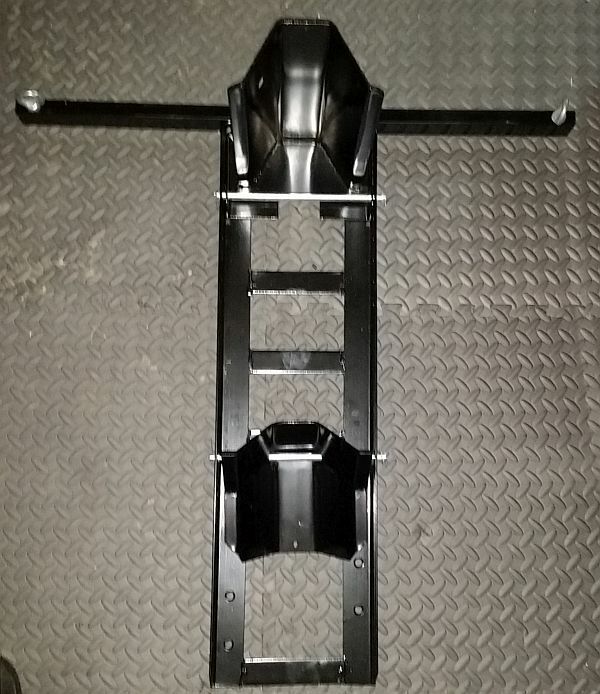 For a whopping $60 I got a HF motorcycle stand/wheel chock. 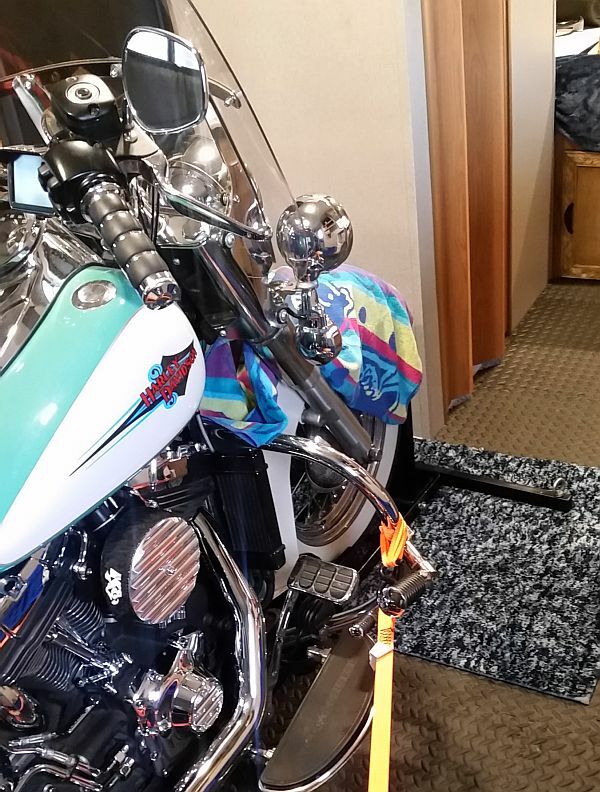 It sits on a throw rug on the rubber mat floor and I can drive the bike right on to it. 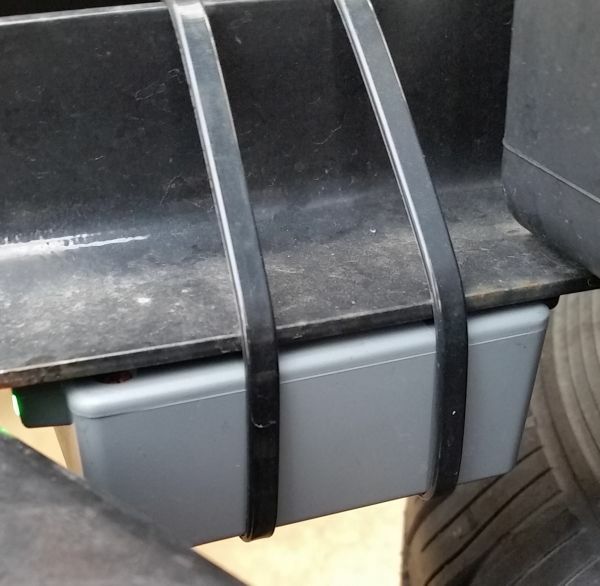 Since the bike is strapped to the tie-downs in the trailer floor, I have found no need to secure the chock at all. 60. Put some MaxxAir vent covers over our to OEM vents. 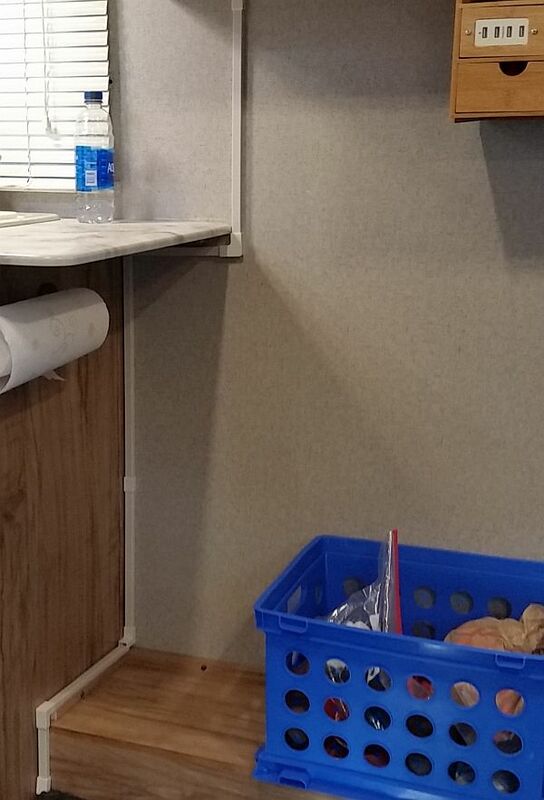 This allows us to have the vents open while it is raining without it raining INTO the trailer. 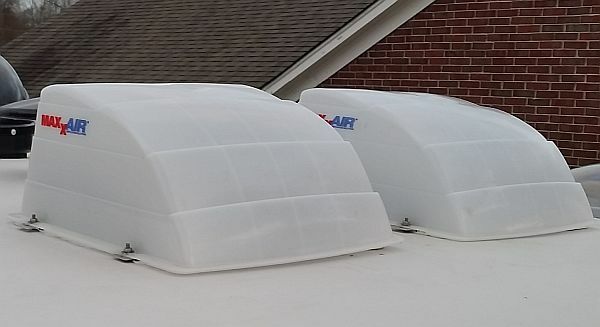 We can leave the vents open while gone from the trailer, or while sleeping, and not be concerned about if it will start raining or snowing. Makes life simpler! 61. This little "Save-a-Step" adjustable brace makes a very nice improvement. 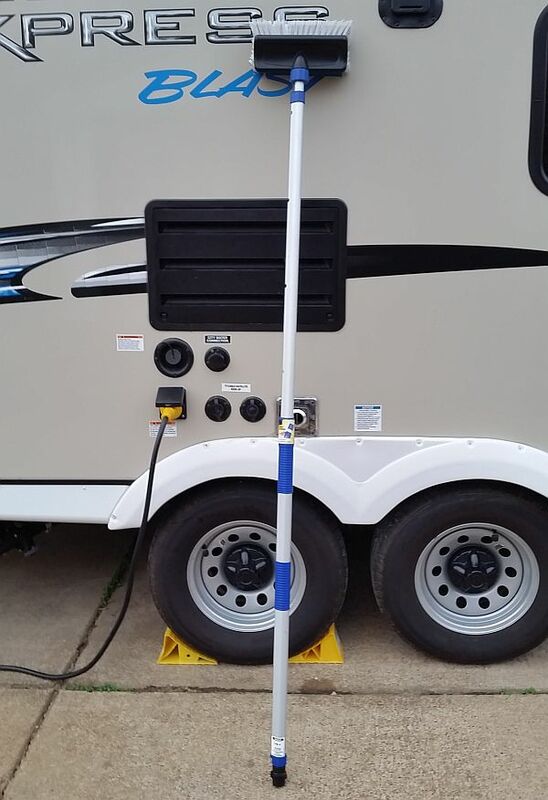 Keeps the step solid and also reduces trailer movement when stepping into the trailer. 62 & 63. 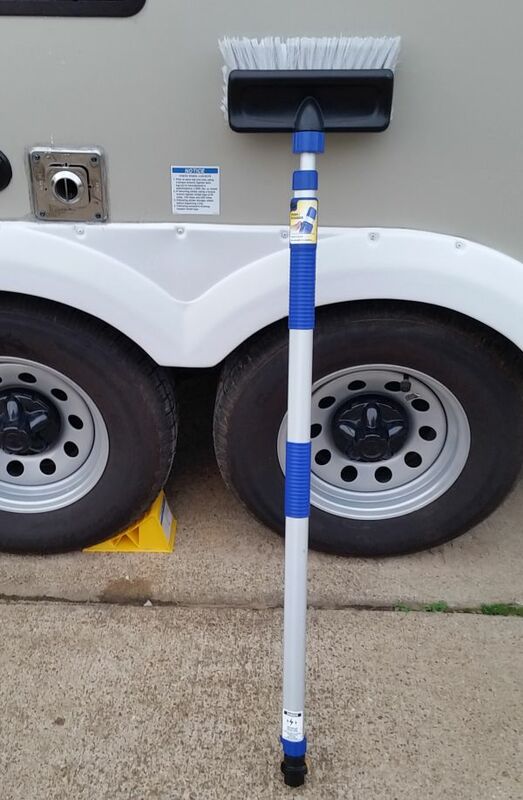 To make washing the trailer easier, we got a telescoping brush. 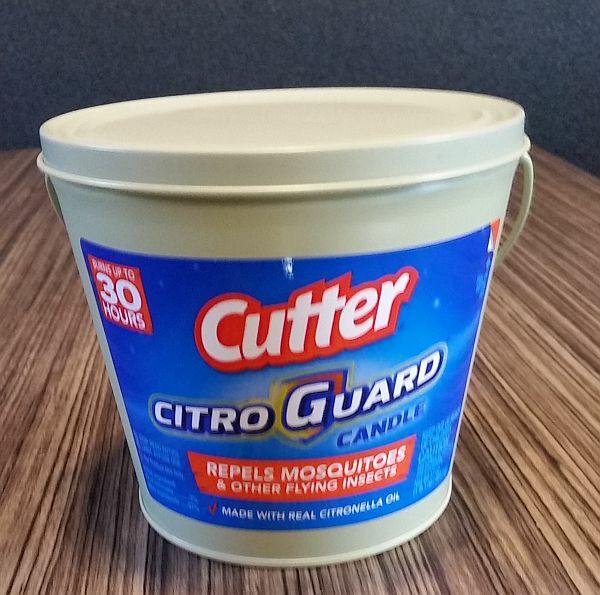 It can be used just to dip into a bucket, you can also hook a hose to the end of it. Makes for quick work of giving the trailer a wash.
Also pictured are wheel chocks that we have for each side of the trailer. 64. Also about washing the trailer. We use the McKee's 37 Sio2 wash. It is very foamy, and also has a small amount of ceramic in it to give some protection and a brighter look. This has worked very well for us, enhancing the look AND making less stick to the surface, resulting in easier cleaning. 65. 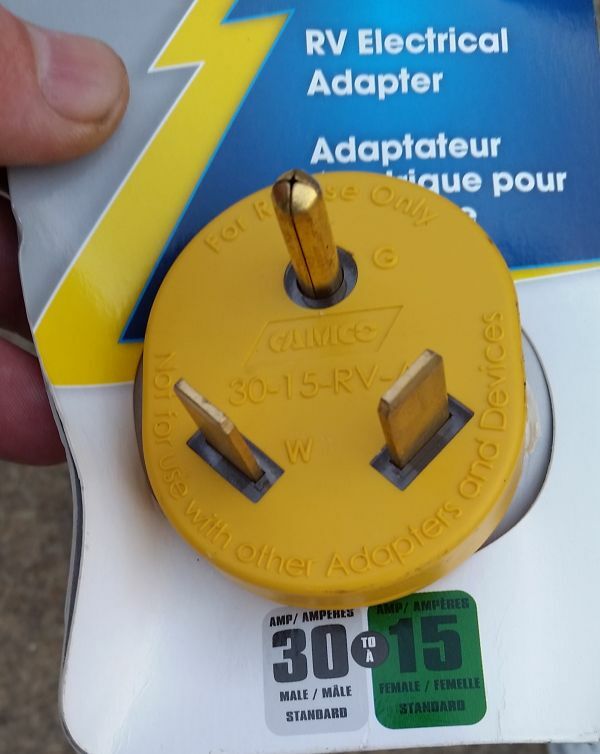 An adapter to plug my 30 am cord into a home style (15 amp) outlet. This is VERY handy, and is what I use for shore power in my driveway, or wherever else I may be that has a regular home style outlet. 66. 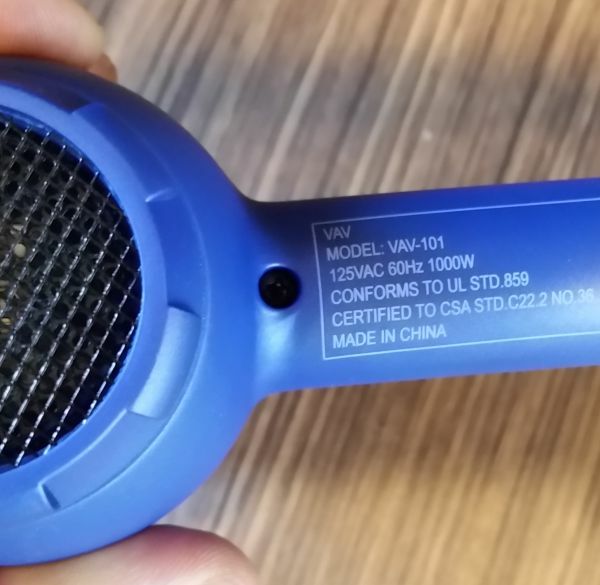 A 50 amp to 30 amp adapter. Useful if I am at a spot that only has a working 50 amp outlet. I can plug into it, then plug my 30 amp cord in. 67. 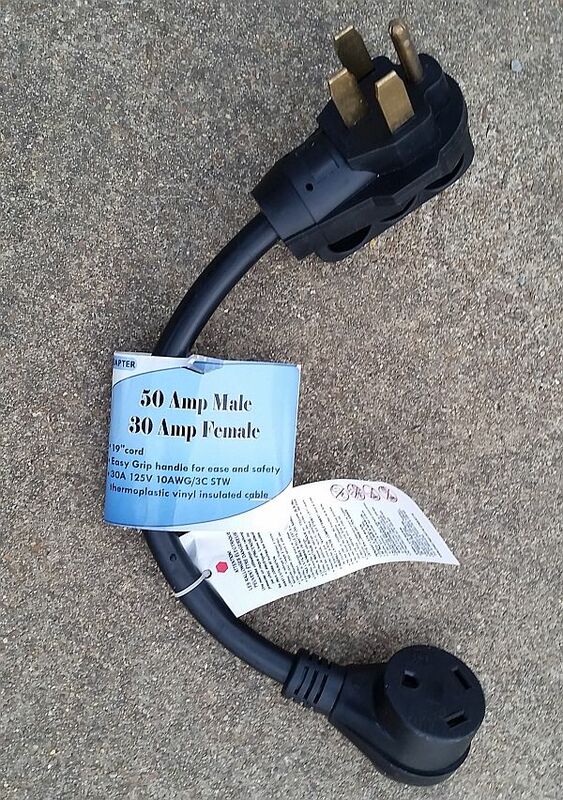 This allows me to plug a regular (home style) extension cord into a 30 amp outlet. 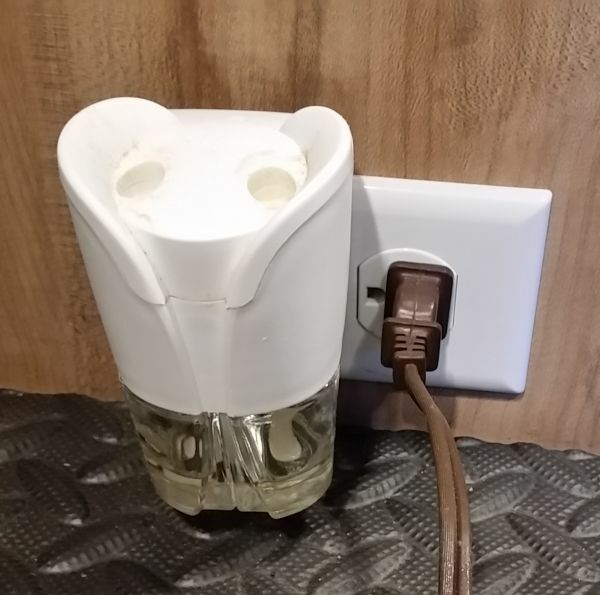 I've had to use this a couple of times where the 30 amp outlet was simply to far away to plug into. 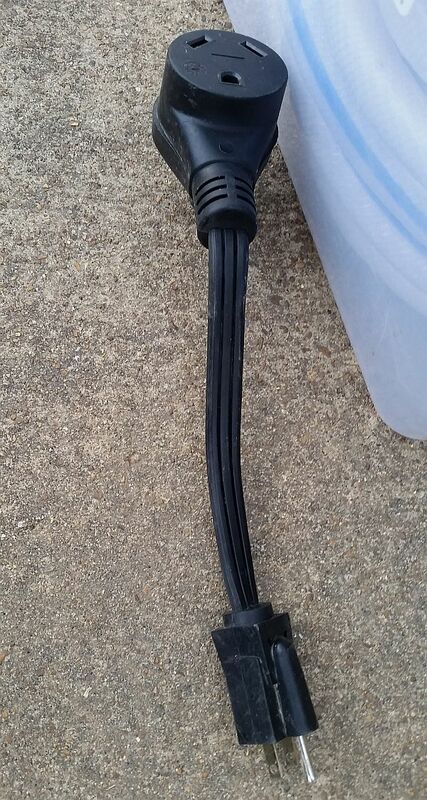 I ran a 15 amp extension cord, giving me the extra length, to my 30 amp trailer cord. Of course, I did not have the full 30 amps worth of power available, but 15 amps is better than none. 68. 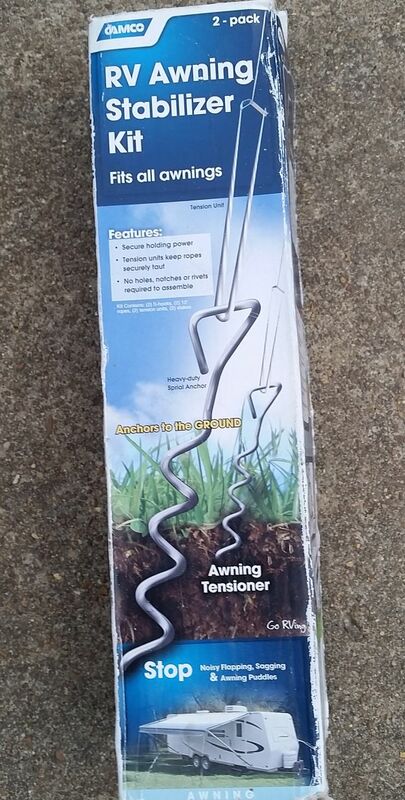 Awning stabilizer kit. We've carried this all around the country, into Mexico too. Never used it once. One day we may be happy we have it....we'll see. 69. 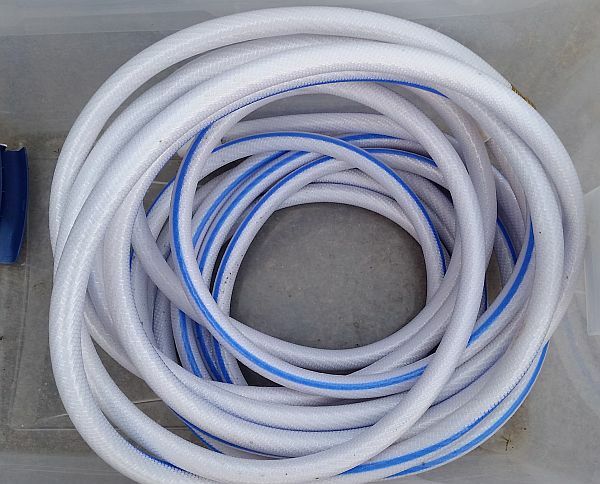 Two 25 foot lengths of fresh water hose. We generally use just one of them, however, a couple of times having the second one has come in handy. 70, 71 & 72. Up top is our filter. 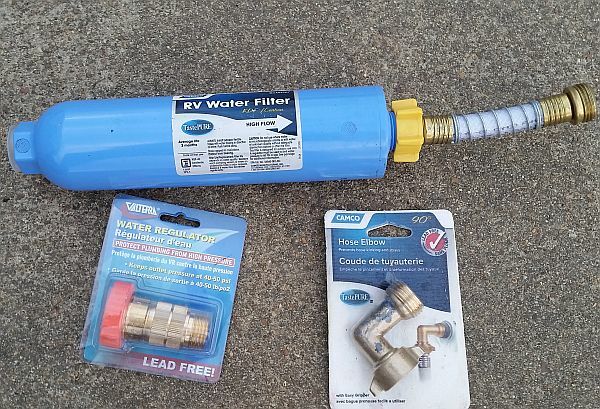 We never put water into the trailer without running thru the filter. Bottom left is a pressure regulator. 95% of the time we run off our fresh tank, but if we're hooked up to city water it goes through this regulator. Have no desire to let some random high pressure supply blow out our plumbing. Bottom right is a simple elbow that we use so that the weight of the hose sticking out from the side of the trailer is not putting constant, leveraged, pressure on our city connection. Little things that can keep a small problem from turning into a big problem. 73. 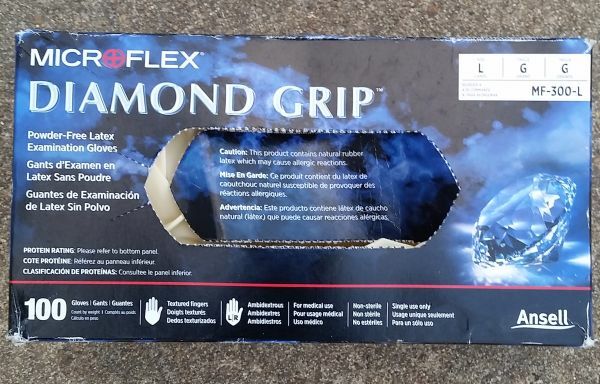 Handy dandy gloves that keep a barrier between me and the nastiness of emptying the tanks and messing with the hoses. 74, 75, 76, 77 & 78. 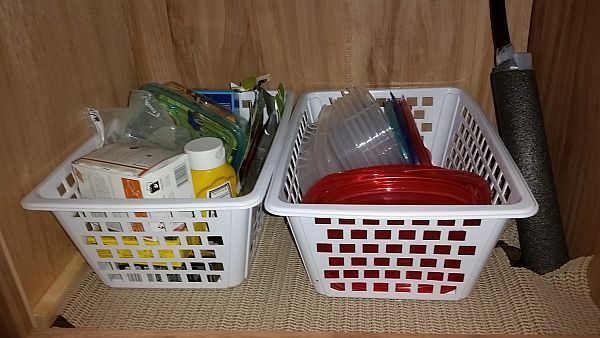 Containers that easily slide in and out of the cargo area. 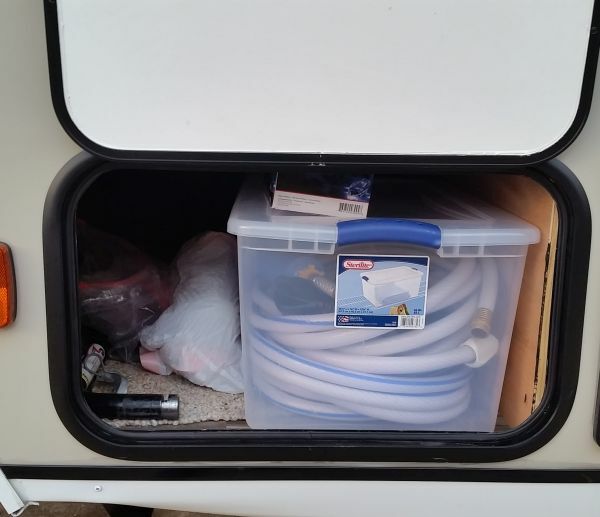 On one side is one with our fresh water hoses and water filter and connectors. Also in there are the various electric adapters. That's it until I take some more photos. Will get that done, and add on here as time allows.